The executions of death-row inmates would be barbaric, but perhaps preferable to lethal injections. The guillotine would be better still—and an end to capital punishment best of all. In Utah, where nine inmates are on death row, their would-be executioners face an obstacle. To kill them by lethal injection, they need a cocktail of drugs. But a European campaign to stop one of those drugs from reaching U.S. executioners has worked well enough to create a shortage. And alternative cocktails have malfunctioned. Thus the response of the Utah State Senate. On Tuesday, it voted to legalize executions by firing squad if the state is short on lethal-injection drugs. "Republican Rep. Paul Ray touted the measure as being a more humane form of execution," AP reports. "Ray argued that a team of trained marksmen is faster and more humane than the drawn-out deaths that have occurred in botched lethal injections." He may be correct. And if lethal injections are ever declared unconstitutional, a provision that's already part of Utah law would revive the firing squad anyway. The tactic was banned in 2004, though that state law didn't apply to already convicted death-row inmates. In fact, Utah killed Ronnie Lee Gardner by firing squad in 2010. The 49-year-old had murdered a lawyer and seriously injured a bailiff during a 1985 attempt to escape custody. At the time, he was in court facing charges in a different murder. He chose the firing squad rather than lethal injection. "None of the firing squad will ever know for sure if he fired a lethal shot," BBC reported. "One gun was loaded with a dummy, probably wax, bullet ... The identities of the marksmen—local law enforcement officers who have volunteered their services—will be protected forever." After a 1996 killing by a Utah firing squad, a witness, newspaper columnist Hal Schindler, described it. "If ever John Albert Taylor felt consuming terror, it would have been in the agonizing 45 seconds before a Utah State Prison firing squad snuffed out his life early Friday morning," he wrote. "That was the elapsed time from the moment Warden Hank Galetka pulled a hood over the convicted child-killer's head and stepped from the execution chamber to the instant that four .30-caliber slugs slammed into Taylor's chest. As quickly as the breath exploded from his lungs, it was over. Taylor was dead before the doctor could make the official pronouncement—before witnesses could bring themselves to breathe again." The column went on to give a brief history of the death penalty in the state, which then included 40 executions by firing squad, two of which were seriously bungled. Wallace Wilkerson, who killed a man in an argument about a card game in Provo, was to face the firing squad in a corner of the jail yard. As the hour neared, Wilkerson strode from his cell dressed in black broadcloth and wearing a white felt hat. In his left hand he carried a cigar, which remained with him to the last. Witnesses noticed "he exhibited unmistakable effects of liquor." The condemned man insisted on not being tied to the chair and he refused a blindfold. "I give you my word," he said, "I intend to die like a man, looking my executioners right in the eye." The sheriff protested, explaining that the sharpshooters would be concealed in a shed 20 feet distant. Wilkerson pleaded, and the sheriff relented. He placed a white, 3-inch patch over the condemned man's heart, stepped back and signaled the shooters. Wilkerson heard the muted command, "Ready, aim . . . " and drew up his shoulders as if to brace himself for the fatal moment. The guns fired; four heavy slugs tore into the condemned man. With the impact, Wilkerson leaped out of the chair and jumped forward "five or six feet." He crashed to the dirt and turned his head downward to his chest. "Oh, my God! My God! They have missed," he screamed. A doctor and several witnesses rushed forward. As Wilkerson writhed on the ground in full view of some 20 spectators, it became apparent the bullets had not struck his heart. By straightening in his chair, he had raised the target and the shooters were misdirected. Three slugs touched the target, but were well above the vital spot; the fourth bullet struck six inches from the others and shattered Wilkerson's left arm. It was 27 minutes before he could be pronounced dead. A similar fate befell Eliseo J. Mares in September 1951 when the firing squad missed his heart and it took several minutes for him to die, according to the column. I oppose the death penalty. In a flawed criminal-justice system, there is a risk of imposing a penalty on an innocent that cannot be reversed or mitigated. And even in a case where the condemned is definitely guilty, there is a risk of harm to the executioners—consider why firing squads are organized so that no one knows who fired the fatal shot—and society if the killing undermines the inviolability and sanctity of human life. The guillotine really seems to solve everyone’s problems: It was designed to deliver an efficient, quick, and painless death. It performs that task admirably. I understand the irony of a reactionary such as myself embracing the Terror’s preferred method of execution, but one must give credit where it’s due. If we’re going to do something—and a large number of Americans and American states are pretty committed to performing executions—we ought to do it right. And “right” in this case means a quick and painless death. I can’t really imagine any reasonable objections to a widespread adoption of the guillotine. I added that I can see one objection: The guillotine is barbaric. But perhaps that's a point in its favor if we must kill. Let's have no illusions about what we're doing when the state carries out the execution of captive prisoners. Perhaps support for the death penalty would decline quickly once actual heads started rolling and Americans better grasped the inescapable brutality of killing men who no longer pose any threat. Barring that, there's always the comparative international data, which is persuasive in its own way. 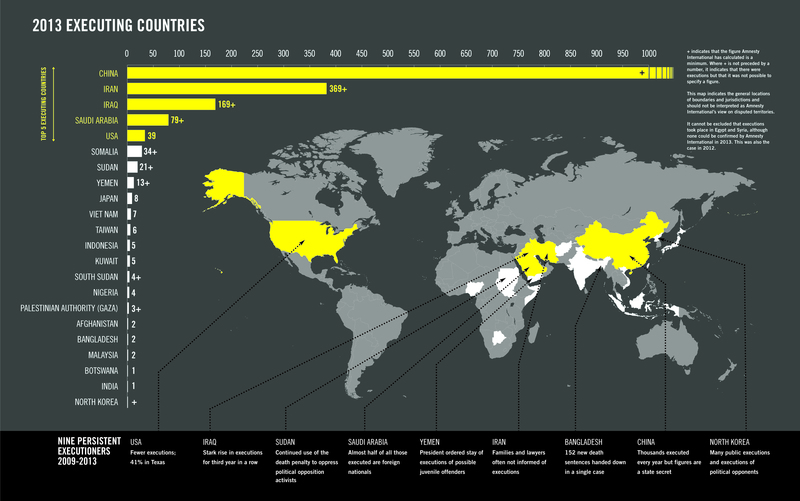 In 2013, the most recent year for which Amnesty International released numbers, the countries that executed the most people, from most to least, were China, Iran, Iraq, Saudi Arabia, the U.S., Somalia, Sudan, Yemen, Japan, Vietnam, Taiwan, Indonesia, Kuwait, South Sudan, Nigeria, Palestine, Afghanistan and Bangladesh. It would appear that successfully implementing the death penalty as policy does not lead to thriving, healthy countries.